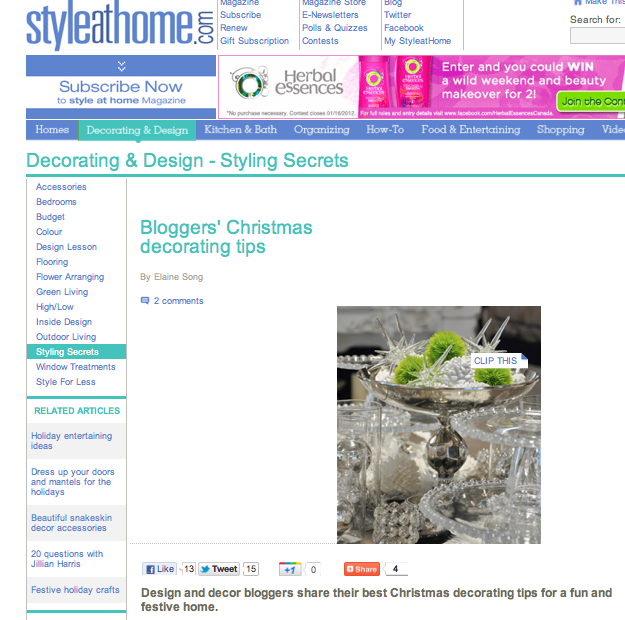 to Style at Home for inviting me to participate in Blogger' Christmas Decorating Tips! So honoured to be amongst the fabulous Rambling Renovators, Desire to Decorate, decor happy, Vintage Paper Parade, aDesign Dock, Sense and Simplicity and Wicked and Weird. Come back Sunday for another installment in my So Canadian, eh? series. It will be my last one for this year. I have an amazing local blogger lined up for this Sunday! I have a fabulous guest lined up for January, she is a mover and and a shaker in the design publication industry! Great feature, Barbara! 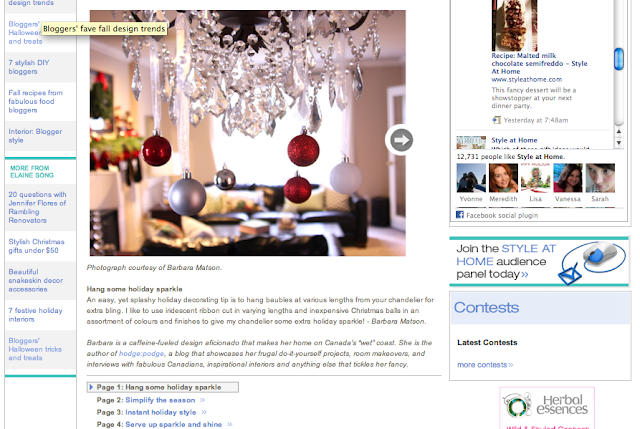 I love your Christmas decor tip. Have a lovely day on the 'wet' coast! Congrats Barbara! You have some gorgeous pictures and great ideas. Have a great weekend. Like I said before .... it was well deserved Barbara! You are full of talent and it should be noticed. I look forward to your last interview of the year!!! Hmmm who could it be??? Congrats Barbara! Love your Christmas decor tip. The iridescent ribbon makes it extra pretty. Congratulations Barbara! Loved seeing your holiday decorating tip on the Style at Home website! What a wonderful honour!